The record is made up of 1 map. It was created in 1904. It was written in English. The original is part of the British Library: India Office The department of the British Government to which the Government of India reported between 1858 and 1947. The successor to the Court of Directors. Records and Private Papers. 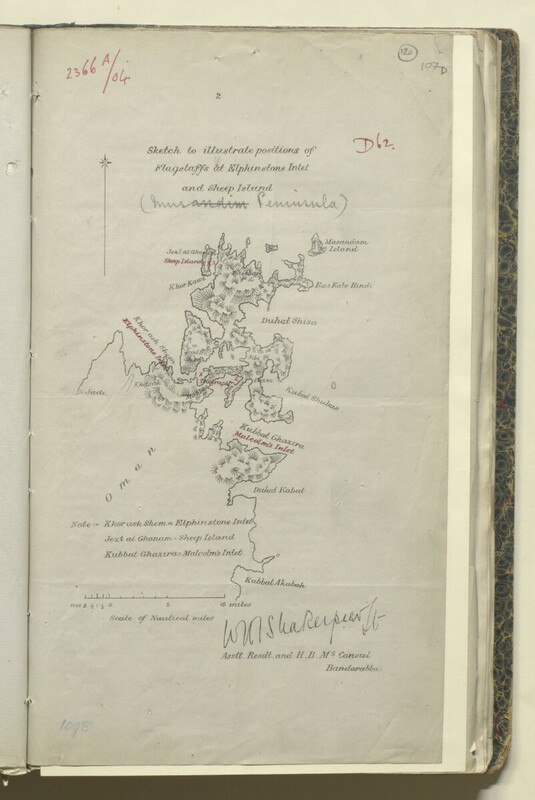 The map is part of a printed report, prepared by Lieutenant William Henry Irving Shakespear, Assistant Resident and British Consul at Bandarabbas [Bandar-e ʻAbbās] in 1904, indicating the position of three flagstaffs erected in November 1903 at: 1) Musandam, close to the Elphinstone Inlet [Khawr ash Shamm]; 2) at Telegraph Island [Jazīrat al Maqlab]; 3) and at Sheep Island [Jazīrat Umm al Ghanam]. The map is printed in black ink, with the location of the three flagstaffs indicated in red. Below the title of the map, written in pencil, is ‘Musandim Peninsula’. Dimensions: 333 mm x 193 mm. Foliation: The map is foliated in the top right corner with two folio numbers. The circled folio number should be used for referencing, while the uncircled folio number should be disregarded.